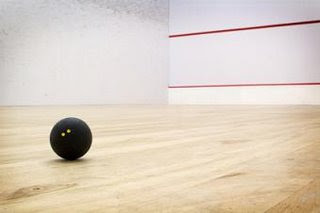 A letter written to the newspaper raised an objection to a sports centre with fewer facilities, prompting a number of responses , mainly in support of the squash courts' removal. You can sign the e-petition to stop the down-grading of Morley Sports Centre here. Recent recipient of WISPA's Most Improved Player award Shelley Kitchen justified her accolade by beating England's Alison Waters in a hard-fought 3-2 win to take the Harrow Greenwich Open title. Natalie Granger's loss to Laura Lengthorn-Massaro in the quarters had robbed the event of its top seed, and Kitchen's topsy-turvey win over Vanessa Atkinson in her semi-final had set up a final that perhaps few would have predicted. While Kitchen looks set to consolidate her position in the top 10 after this win, it could be that 2008 similarly proves a breakthrough year for the 23 year-old from London. Waters has also done well in the January Greenwich event in the past couple of years just prior to the British Nationals, and obviously finds it easier than us mere mortals to raise herself from the post-Christmas torpor (do athletes have these?). Twice in recent years has Waters made it to the final of the Nationals, first in 2005 when it always seemed destined to be Linda Charman's year, and then last year losing to Jenny Duncalf in a close five-game match. On both occassions Waters played underdog, slipping through to the final by playing her unfussy, methodical game as bigger names crashed out. Reaching the final in Greenwich a couple of weeks before the Nationals take place at the National Sports Centre therefore seems like some kind of omen, and in repeating the pattern she'll be hoping it will be third time lucky in Manchester. Beginning and ending 2007 at number 11 in the rankings, Waters had been as high as 9 and low as 14 throughout the year. Quarter final appearances were in abundance, but the last semi she made it to on the main WISPA tour was in Greenwich last year. Success for her by the end of 2008 would be to not finish again as runner-up in Manchester, emulate Shelley Kitchen's recent improvement by ensconcing herself inside the top 10, and grab some WISPA titles along the way. World Squash Day 2008 will be held on Saturday March 15th. In a clever initiative to attract greater participation, this year's event will tie-in with the Sport Relief campaign. "This is great news for the sport and it gives every squash club on the planet the opportunity to support two major objectives: to raise the profile of squash and to raise valuable money for Sport Relief." In previous years, events have taken place in more than 40 countries. World Squash Day is endorsed by the WSF and supported by national governing bodies. 2008 is shaping up into a veritable tournament-fest for squash fans in Britain, with four big events scheduled to attract the world's best players. After a slightly worrying 2007 in the UK, where the Super Series was rescued in the nick of time and the British Open wobbled back to its feet, the coming 12 months look set to bring the sport back to Blighty with a vengence. But why are the British Open finals being held on a Monday? I can only think that it is the availability of venues that means that events can't be scheduled to finish at the weekend. This can't be good for the average working spectator, who would struggle to attend a Monday final if it is not held in their home town. 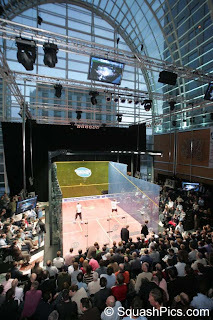 The geographical spread of these events is also important in bringing the game to a wider audience, as is the return of the Super Series to Broadgate - as I've said a number of time before, harnessing the financial muscle that only London can bring is crucial to the sport again dropping a firm anchor in the UK. However, it's a shame that although WISPA's finest will be there for the BO and the World Open, there is no big women-only affair to match Canary Wharf of the Super Series. While fans of the men's game will get to see the likes of Shabana and Ashour, it is only rarely that spectators in Britain get to appreciate the skills of Nicol David and Natalie Grinham. How about a women's Super Series for Broadgate? Ramy Ashour celebrated his return after injury with a win over James Willstrop in the final of the Tournament of Champions, held in Grand Central Station, New York. First reports suggest that the Egyptian's 3-0 win over his 24- year-old opponent - a much-anticipated rivalry that many hope will continue for years to come - doesn't tell the whole story, with the 11/7, 13/10, 11/9 scoreline a close affair between the two attacking players. A recent article in the New York Times reports that squash is increasing in popularity in the country, with young people choosing squash as a sporting route into studying at Ivy League universities, taking advantage of a system that has long aided American football and basketball players. "College is not the only reason the game is enjoying a youth boom. In recent years, squash leagues and tournaments have become more welcoming to intermediates and novices, said Kevin Klipstein, the chief executive of US Squash." "Proponents have also managed to sell the sport's appeal outside its traditional preppy demographic. Several private clubs in New York have opened their courts to teams of young people from the inner city." One these initiatives is the Citysquash programme, a scheme that uses squash to provide an "after-school enrichment program that provides motivated and talented young people from economically disadvantaged households with a nurturing and structured team environment" based in the Bronx at Fordham University. Its Board of Advisors includes Jonathan Power. The US professional circuit has also received a shot in the arm in the past couple of years, with John White moving his base there and Natalie Granger qualifying as a US citizen through residency. In the junior ranks too there is evidence of talent coming though the system with Olivia Blatchford - recent winner of the Irish Junior Open U19 title at the age of just 14 - looking a strong prospect for the future. 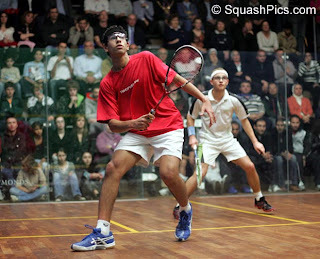 Egypt sent out a warning for the future to the other leading squash-playing nations in the recent British Junior Open. Six of the eight age-category winners hailed from north Africa. And although the Egypt's women have a smaller representation at the top of the WISPA rankings, their strength in depth was evident in wins by Nour El Sherbeny (G13) and Nour El Tayeb (G15). England, Australia, Pakistan, Canada and France - historically the countries that can be classed as the other leading squash playing nations - fared less well overall in the junior tournament held in Sheffield. For an excellent analysis of the top countries' overall year-on-year strength, as represented by rankings, see this article by Tomas Jovanovics. The 9th World Squash Refereeing Conference was recently held in Chennai during the World Men's Team Squash Championships. The itinerary featured a number of sessions on consistency when officiating. 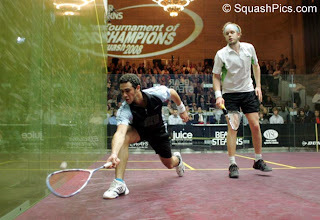 Inconsistency riles players of any sport, but squash suffers particularly from disagreements where a player feels a decision has been made where the officials are unsighted (due to the position of the referee and the marker in the back wall seating, the ball and players' bodies are often obscured). The most significant development in officiating the sport over the past year or so has been the re-introduction of the 3-referee system. This appears to have been a success with players and officials alike (though has not yet been rolled out across all PSA and WISPA events) and has ironed out some refereeing inconsistencies. To a spectator, the officials seem to do an amazing job, and are generally treated with respect by the players. However, players themselves have voiced opinions on the need for a greater professionalism attached to the job of being a squash official, and it is true that altercations between players and officials can often look uglier than they are when magnified in the goldfish bowl of a glass show court. 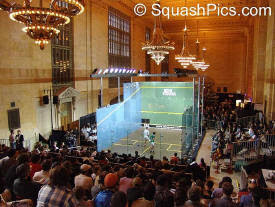 This can give squash a disproportionately bad image, especially when compared against a sport like football, where the players give the officials all manner of abuse, which the spectator conveniently ignores as they either cannot hear it above the crowd noise or are distracted by other things happening on the pitch. It would be interesting to explore how other technologies could be used to assist the officials when making certain decisions. Lets/no-lets require the subjective interpretation of experienced officials, but proving whether a ball was down or not could surely benefit from a technological solution. The minutes of the conference do not yet appear to be on the WSF website - comment to follow when they appear. The third annual World Squash Awards took place on 21 December at the RAC Club in Pall Mall, London. It would be difficult to argue against the PSA and WISPA Players of the Year (Amr Shabana and Nicol David respectively), as both spent the year further cementing their lengthening holds on the world number one spots. Less predictable was the WISPA Most Improved Player, which Shelley Kitchen won, maybe due to her unexpected win over Nicol David in Madrid's World Open. Over the past 12 months the New Zealander has risen from 14 to 10 in the rankings, and while breaking into the top ten demands a greater consistency of performance which many players find hard to sustain, in purely statistical terms the award seemed a little hard on the other nominees, who have maybe taken greater individual steps. It's a shame there wasn't a PSA Most Improved Male Player of the Year award, as Peter Barker would surely have been a good bet after his rise up the rankings and triumphant anchor-leg performance in helping England to retain the World Teams. It was also interesting to see a non-player recognised, with the journalist Dicky Rutnagur honoured for his coverage of squash, which began back in Hashim Khan's breakthrough days. "Bound to create a good deal of interest in squash circles"
Abercorn Sports Club in Edinburgh has (apparently) achieved a world first for squash. 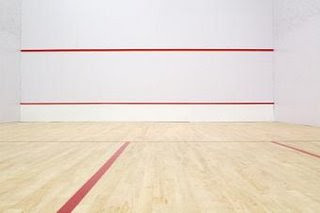 The heaters have been fitted in courts 1 and 2, and "are of a type not fitted in any other squash courts in the World". Used in a recent closed tournament, they were voted a great success. And as they promise to provide "players and visitors with a stable court temperature regardless of outside temperatures", they are "bound to create a good deal of interest in squash circles". Many squash players will be going blue with envy as they spend the first 15 minutes of their winter months' court time frantically pummelling a two-spot in avoid it dropping like a stone. And first in the firing line is Harry Pearson in the Guardian, goading the great game across the Christmas-New Year demilitarised zone when the 'blogger was back in barracks. Yep, they're either unapologetically sh*t, or A VERY BAD IDEA. They are not, by any stretch of the imagination, funny. What is it about sport and comedy on TV? Try and think of an example where the two conjugate successfully. It's pretty damn hard. Has there ever been an edition of A Question ... that hasn't featured some gurning ex-pro resorting to some lame laddish banter about Sue Barker's matronly tone in order to raise an arms-folded titter from his team mates? The one glorious exception that comes to mind where sport and comedy avoided the preditable NASCAR pile-up is the film Caddyshack (Rodney Dangerfield RIP). I wonder if he's been to see the play Water that I recently reviewed here. I loved the 70s - in fact I was born during them: the year of KISS's Destroyer tour, when global warming hadn't been invented, and unnaturally hot weather was greeted by regional news crews broadcasting housewives frying eggs on the bonnets of Ford Capris, rather than the holding international climate summits. But given that in the space of little more than a month I've read an article and seen a play that both represent squash as a pastime still enjoyed by the likes of Tony from Abigail's Party rather than Lewis Hamilton in a pre-season fitness drive, then maybe we should be worried. After all, why are clichés clichés? At least none of the top PSA pros now sport large mustaches, which seemed essential to attaining consistency of length and longer rallies in 1977. When the opposing team incorrectly guessed Venus Williams as the sports star shown, the answer was obviously Serena Williams but Warne thought differently and thought it was Roger Federer despite the two having different skin tone and being of a different gender.